NCLR Ushering A New Era of Inclusion... Saying we should be UNIDOS! NCLR Ushering A New Era of Inclusion… Saying we should be UNIDOS! Since 1968, NCLR—has remained a trusted, nonpartisan voice for Latinos. We serve the Hispanic community through our research, policy analysis, and state and national advocacy efforts, as well as in our program work in communities nationwide. And we partner with Affiliates across the country to serve millions of Latinos in the areas of civic engagement, civil rights and immigration, education, workforce and the economy, health, and housing. but my mission is different this year. Last year I wanted to learn all about this organization and more importantly why more East Coast non -profits are not plugged into this organization who provides a wealth of capacity-building assistance, policy analysis, advocacy and the opportunity to really impact the lives of Latinos across the country. What I found out is that there was a common belief that NCLR was only for the Mexican Community. I also know that nothing can be further from the truth. As I landed in Orlando in 2016 for the conference, I connected with my childhood friend Amory and his colleague Mirian (both dedicated members of the board of the Cypress Hills Local Development Corporation or CHLDC)) who were attending the conference to receive the East Coast Affiliate of the Year award. I wanted to spend some time with them to dig deeper into the mission of the organization as I had been considering accepting their invite to join. I was already impressed by the CHLDC because I can actually see the change they have created in a community I spent 30 years in but I was especially impressed by the role that NCLR plays in this success. Fast forward to 2017, today I am one of the newest members of the CHLDC’s board and I am back here to attend some workshops and find out how I can bring some of this training back to Cypress Hills and deepen our ties with NCLR. I just found out that this is the last NCLR conference… ever. The organization, based on feedback (primarily I believe from East Coast /Non Mexican affiliates) decided to rebrand in an effort to be more inclusive has rebranded to UNIDOSUS. It seemed to stir up some controversy but I believe what matters most is that NCLR / UNIDOSUS will maintain and increase the amount of impact they can have in today’s America with all of the uncertainty that surrounds us. As many of you know… I am an ambassador for Toyota and stay close to their community efforts and one of my favorite things about the whole conference is the Latinas Brunch, where aside from hearing amazing stories of shattering glass cielings, we also get to see one very hardworking affiliate walk away with a brand new vehicle that will serve as a tool for them to carry out or increase their work in the community they serve. This year, I thought I would actually broadcast on Facebook LIVE so that YOU can be there with me. I want to share that video with you right here and now. WATCH THE LATINA BRUNCH NOW! 11:00 Peter Villegas VP of Latin American Affairs of Coca Cola’s sponsor message. 14:40 Joel Helle VP, Sales Strategy of Growth for CVSHealth sponsor message. 17:35 John Muñoz, Director of Global Diversity and Inclusion for Hilton sponsor message. 1:20:00 Keynote Speaker Sandra Guzman takes the stage. 1:40:00 Adrienne Trimble, General Manager Diversity & Inclusion for Toyota USA presents the winner of the 2018 Toyota Highlander Hybrid. El Concilio was presented with a new Toyota Highlander Hybrid at the 2017 National Council of La Raza (NCLR) Annual Conference and National Latino Family Expo. 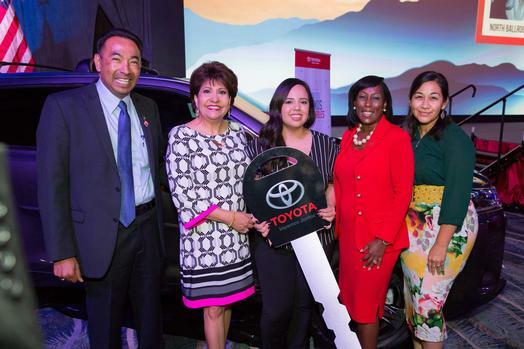 The award was part of Toyota’s national inspirational campaign Juntos Somos Imparables, now on its fourth stop on a national tour. The campaign features an experiential art installation designed to inspire the Hispanic community. I hope you enjoy this exclusive glimpse of the NCLR Latinas Brunch brought to you by Toyota Latino & Sofrito Media Group. Special thanks to the CHLDC for sponsoring my trip and to the Hyatt Regency for their hospitality.